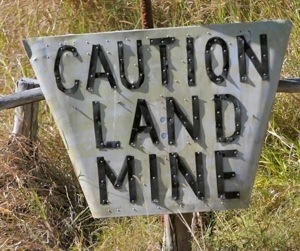 Does Your Husband Think You’re a Land mine? My name is Carrie Okie and I am a recovering land mine. I sincerely hope my husband can recover from the land mine I used to be. It is inconceivable to me that my husband would not know what is wrong with me. After all, I asked him to do something two days ago and he still hasn’t done it. As time goes on, steam is starting to rise in my spirit. Oh! And there he goes adding more fuel to my fire with a couple of other behaviors that drive me nuts. HE HAS TO KNOW WHAT’S WRONG WITH ME? HOW COULD HE NOT KNOW? The steam continues to soar. . .
All I need is some ignition and we will have a full blown four alarm fire pouring out of my mouth and hateful facial expressions. And now here he comes with that fuel. He finds the courage to ask me, “Is something wrong?” WHAT’S WRONG? REALLY? YOU MEAN YOU DON’T KNOW WHAT’S WRONG WITH ME? How could you not know when I am remaining completely silent and shutting you out? You mean my sighing all the time and slamming cabinet doors and lugging laundry around with a spirit of wrath hasn’t made it all clear? He asks because he loves me and he wants to know so he can fix it (He is awesome at fixing things but not so awesome at reading my mind and translating my subtle body language that I think is obvious). . .
After all, if he doesn’t know what’s wrong with me by now, he doesn’t deserve to know. If he really loved me, he would respond in the way I secretly want him to. He is confused. He is scared. He has no idea what is coming at him or why. He cannot communicate his valiant heart from this place of fear and uncertainty that I have created. To make matters worse, I have let him know with my words, my body language, and every disgusted sigh that I do not RESPECT him. I have not “won” anything worth having. My husband is also a huge loser in this scenario. But Satan is oh so happy he could get me that crazy. Even if I only ride the crazy train a short time, the enemy can do a lot of damage. So I am digging up the land mines and retiring my grenades. 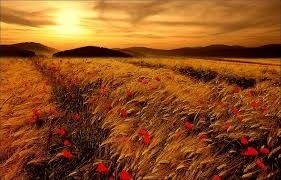 I want my husband and I to walk in a field of sweet Kansas wheat growing in “okie” red fertile soil. I want to plant wildflowers along our path and provide some cool, refreshing wells along the way. . . I will have to be quieter. I will have to believe that my husband is always a great man with good intentions. I will have to release the selfish desires that stir my spirit the wrong way. . . It will not be easy because I am a mouthy, fiery, little thang. But when we lay our heads back in the beautiful field of our marriage and see flowers growing where there used to be land mines. . . well, that will be worth it. So I have decided to blog. . . to share the inner workings of mind and spirit. . . but let’s face it. One more person blogging is nothing new. . . but every blog is, in it’s own way, a tribute to another blog. I am a creative person who loves to communicate so I obviously love the parts of the blogosphere that I have visited. There are many family blogs that I follow to stay connected to the parts of my heart that live far away from me. And what Oklahoma girl doesn’t like to see what The Pioneer woman is up to. . . especially if that girl is a Okie city girl turned Kansas farm wife. Blogs are thought provoking and entertaining and all of that. . . except for this one blog. . . on this one night. . . a long, long time ago. Somehow we made it home from the geneticist’s office after finding out that our sweet little baby couldn’t lift his head because he was missing a tiny, little piece of a chromosome. . he called it a “mistake” of cell division. And then he painted a terrifying picture of our future locked in the chains of Prader-Willi syndrome. . . and the little bit of hope that was left in my heart began to die. It left bit by bit with every exhale and every tear that rolled down my face. When we got home that night, everything was right where it should be. . . except for my future. It was gone. I no longer saw the vision of a marriage with promise and purpose. I thought I was prepared for motherhood but now stood in the weight of knowing that I could not walk this road that lay before me. It was dark and a little chilly as I began to search for the promise of peace. I typed in “PWS and mom” in my search window. If somehow I could connect to some woman somewhere who was living this life – – maybe I could believe that I could too. It was a blog site that popped up that night. . a simple little family blog about a family on the other side of the country. They looked happy. They looked strong. And providing the foundation for the whole miracle was a woman who happened to be a mother of seven beautiful children. . . three of whom happen to have PWS. . . and there happened to be a link to her e-mail. . . and a tiny crack of light came through my deep darkness. Not only did she happen to answer my e-mail but she purposely led me through the water that was too deep for me to manage until I got stronger and the water got more manageable. Yes, God saved my life that night. He protected my heart. He held tight to my future. He gave me exactly who I needed at the exact moment that I needed them most. And he used a blog to do it. so every day that I ask Him to help me live my life in a way that is worthy of the calling that I have received. . . .I know He will and I know I will because I know that across the country she does it too, every day. . . So here I am starting a blog with tags like PWS and Mom. . . of course my first blog would be dedicated to the blog (and the woman) that saved my life. . .